It is getting hard to pick restaurants every month, and it isn't because there is a lack of places to go, the problem is there are so many great places popping up around the city and it is getting hard to decide which place to try next. 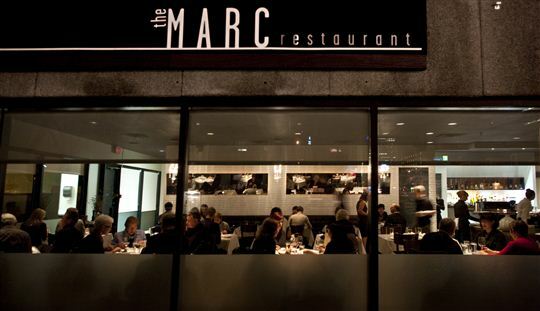 Last weeks dinner club took us to the MARC restaurant, this was my second visit to the downtown establishment and for a second time I left feeling fully satisfied with the evening. 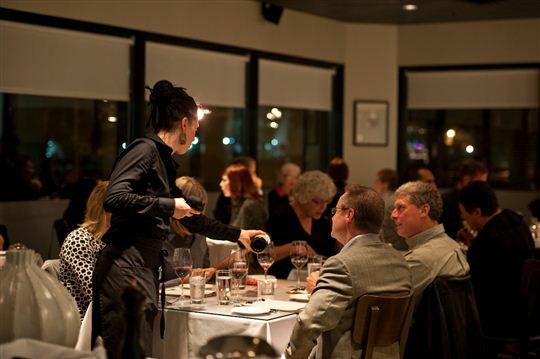 The MARC restaurant is located right in the heart of Edmonton's downtown, the restaurant itself has a semi-modern feel with clean lines, and crisp whites accented with darker booths and chairs. We started the meal off with a shared appetizer, the frites with truffle aioli, nothing special here, just your basic fries with aioli dip, but it satisfied our hunger until dinner was served. For dinner I took my servers recommendation and went with the scallops instead of the featured Arctic Char.... the scallops were served with a pea puree and steal-cut oats, which made for an interesting yet delicious combination that I would never think to put together on my own! It usually goes without saying dessert never gets away from us ladies, and this evening was nothing different; needless to say we had a hard time deciding.... so went with all 4 featured desserts!! The Beignet dessert was the one I was looking forward to the most, 7 deep fried nuggets of pastry, sprinkled with white sugar and paired with both a caramel sauce and creme glaze..... ugh.... my mouth is watering thinking about it.... it was sooo good! The chocolate option was also really good, a rich chocolate cake with salted caramel and pecan filling.... these two desserts were definitely the favourites of the four, and not to say the creme brulee and lemon tart were bad, just nothing special in comparison to the others! Us girls chatted late into the evening, and were a little surprised when we looked around and noticed mostly everyone else had cleared out! That is usually the way things go at dinner club..... I always look forward to our next visit! This place is definitely on my list of restaurants I want to try in the city! There are so many great places, but I would absolutely say this one is a must!